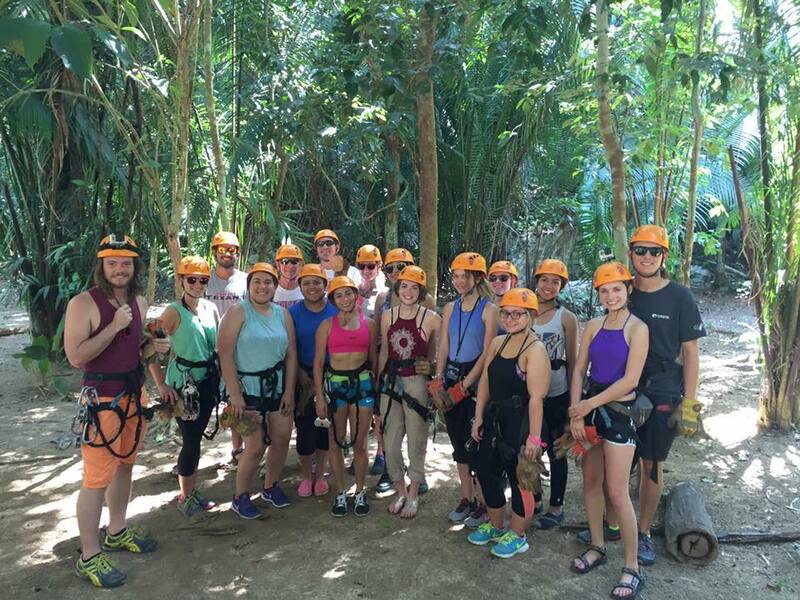 Lee College Study Abroad students and faculty prepare to zip-line through the rainforest during their eight-day trip this summer to the Central American nation of Belize. The program, which allows students to experience another country while also earning credit for their Lee College degree, will host trips to China and Costa Rica in 2017. BAYTOWN, TX — After a long and challenging climb to the top of the Xunantunich ruins during the Lee College Study Abroad trip to Belize, Miranda Sprinkle looked down at the earth 130 feet below and felt her eyes well up with tears. From the peak of the ancient Mayan ruins and archaeological site — one of several spots explored by Study Abroad students and instructors during their 8-day stay in the Central American nation — visitors are treated to a staggering view of the Guatemala-Belize border and the lush jungles that surround. Study Abroad allows students to experience another country while also earning academic credit for their Lee College degrees. The program was revived at the college in summer 2015 with a trip to Great Britain, Ireland and Wales. Two travel destinations are planned for summer 2017: China and Costa Rica. Before leaving for Belize, Study Abroad students had to complete intensive English and kinesiology classes that provided a theoretical foundation for their journey, and prepared them physically for the activities they completed. The English course centered on the unique relationship between place and identity, and eco-composition — a way of examining writing and literacy by using concepts from ecology. In presentations to the campus community about what they saw and felt in Belize, students spoke often about how the journey helped them to grow as scholars and individuals. Many returned to Texas with a changed perspective on life and their goals for the future — inspired by the beauty of the land and sea, the excitement of discovering new and unknown places, and the warmth of the Belizean people. As one of two faculty members who traveled to Belize, Honors Program Coordinator Georgeann Ward was impressed by the students’ depth of knowledge and determination to soak up everything the country had to offer. Graeme Cox, chairman of the Kinesiology and Wellness Division, also accompanied the students abroad.